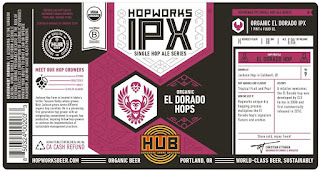 PORTLAND, Ore. – Hopworks Urban Brewery (HUB) today announced the release of Organic El Dorado Single Hop IPX. 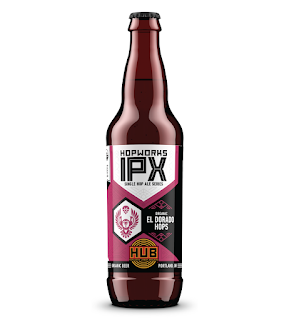 The beer is the ninth bottled release in HUB’s IPX Single Hop Ale Series, providing drinkers an educational celebration of hops for more than three years. 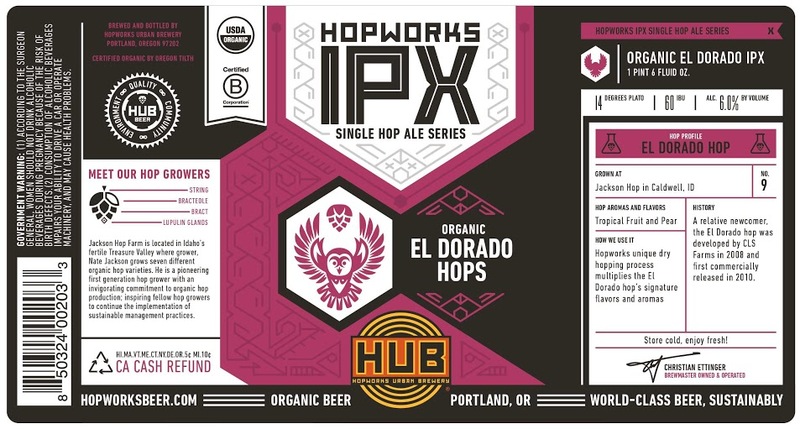 El Dorado IPX is available on tap and in 22oz bottles in both Hopworks’ pubs and throughout the Northwest. El Dorado IPX contains certified organic El Dorado hops from Jackson Hop farm in Caldwell, Idaho. A relative newcomer to the brewing industry, El Dorado hops were developed by CLS Farms in 2008 and released commercially in 2010. Organic El Dorado IPX is a light bodied ale showcasing tropical fruit and pear hop flavors and aromas. Each beer in the series is brewed according to the same base recipe, with the same finishing hop schedule, and ends up at 60 IBU and 6% ABV. Every IPX release is an opportunity to compare and contrast ways that hops affect beer’s flavor and aroma profiles. 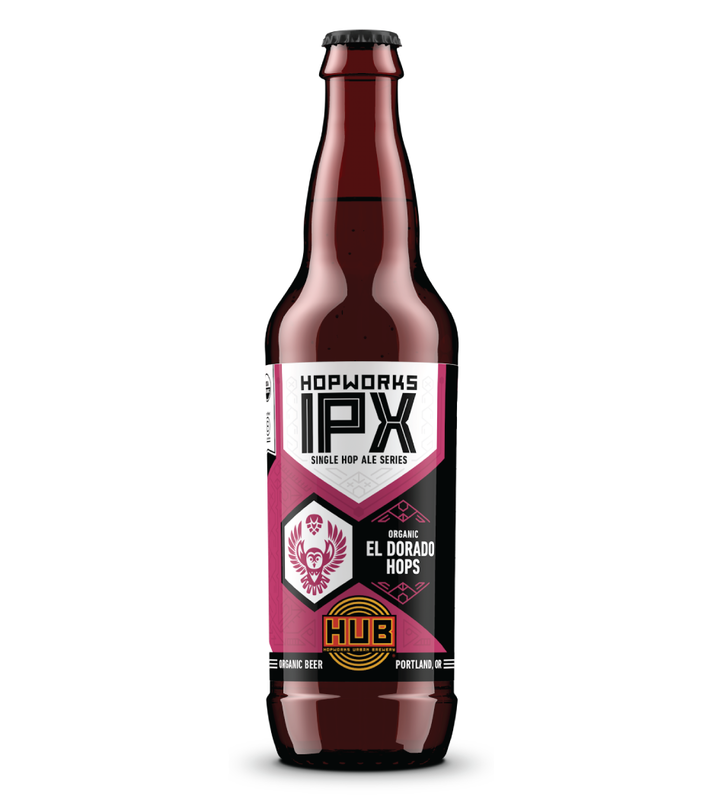 Hops previously featured in the IPX bottles include Organic Cascade, Organic and Salmon-Safe Centennial, Amarillo, Organic and Salmon-Safe Chinook, Organic Ahtanum, Organic Fuggle, Salmon-Safe Mt. Hood, and Organic Simcoe hops. Hopworks Urban Brewery strives to revolutionize and inspire the brewing industry with practices that drive quality, protect the environment and improve the community we live in. Utilizing organic malts and a combination of locally-sourced organic and Salmon Safe hops, the company’s 20-barrel brewery produces 16,000 barrels of beer a year for HUB’s two brewpubs and for distribution throughout the Northwest. Hopworks is a family-owned and operated business, the first Certified B Corporation brewery in the Pacific Northwest, a gold-level bike friendly business, and is recognized as one of Oregon’s Best Green Companies. Visit Hopworks online at HopworksBeer.com and follow us on Twitter, Facebook, and Instagram.